The gathering place in the bottom of Jernigan for students’ late night snacks and seating for live music is close to being functional again. Everything but the food is in place and ready to go. A main attraction point for undergrad students and visitors alike will soon be fully functioning with new menu items, more seating and a new stage complete with easy set outlets for concerts. The newly created Hub exhibits an extended coffeehouse feel, that will soon be filled with burgers and grilled chicken wraps. The stage, will give a small venue feel to what was already a favorite spot on campus for many. 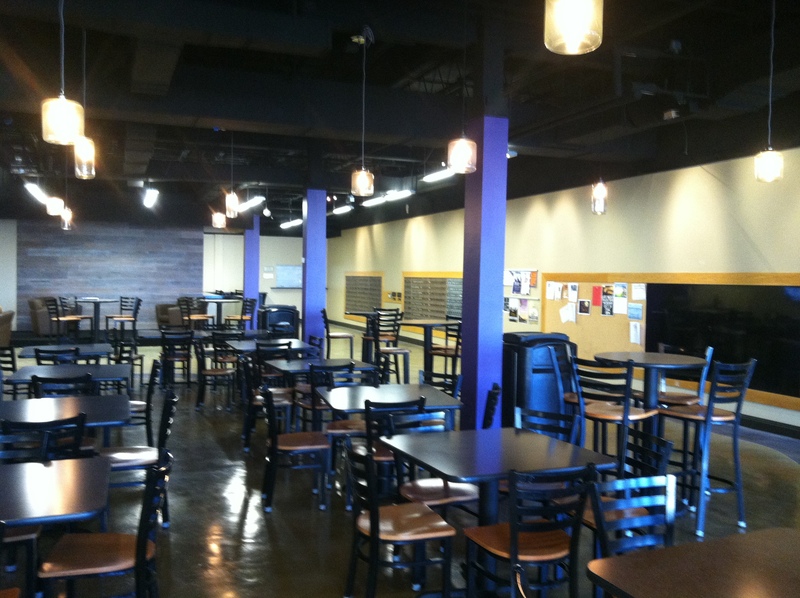 The once populous gathering place has been a “hub” for nothing but settling dust and construction workers over the past few months as Trevecca decided to revamp the area a few weeks before students returned for the fall. A plan, Glen Linthicum, director of plant operations, said could have waited a few months to begin. “[The planning committee] decided to change the menu. And with the menu being changed, [they decided] they’d like to go ahead and renovate the Hub. At first it was ‘let’s just slap some paint on it and do this and do that,’ but it got a little bit more extensive than that. And it’s important that it got extensive because the Hub is probably one of the main centers that almost every student touches,” Linthicum said. The original plans had the Hub finished weeks before midterms and fall break. However, because of many things out of Linthicum’s control, the project slowed and is just now coming to an end. Things as simple as lights to hang that were supposed to arrive in days, were back ordered six weeks. Some supplies didn’t make it at all, and came up missing in route to Trevecca from the warehouse. “Some projects go smoother than others. This one has not gone smoothly,” Linthicum said. Those annoyances have been constant and along with missing parts, Linthicum had to wait several weeks on a permit from the city in order to shift around the oven and other kitchen equipment. However, all that is being waited on now is the food, which is coming. The space is being prepared for the cooks who will begin to work their craft soon, however Pioneer, which Trevecca outsources the food vending to, has to train cooks and servers in the new venue. When it arrives though, expect premade sandwiches ready to go, along with a Chipotle style burrito bar. While Linthicum said that the uncompleted Hub has been “an inconvenience” for students because of the limited selection of food options on campus, he points out that the Cube in the Boone Business Building has been opened longer hours to help compensate for the lack of options. The Cube will return to its normal hours once the Hub opens back up, Linthicum said. With all the added time and stress of the hub not being operational, Trevecca has not spent any more funds than were originally calculated for the project. However, Pioneer is not gaining the extra revenue that would be streaming from a fully functional Hub.